29 January 1980 Sir Crisp Gascoyne the first Lord Mayor to live at Mansion House in 1752; plate stored there since; annual plate indenture; growth of Corporation’s plate 16th – early 18th century; bequests since 18th century; details of the Lord Mayor’s Collar of SS and jewel; former habit of refashioning plate; famous pieces. 29 April 1980 Problems of limited Thames Crossings before the mid 19th century; tolls; proposals for new crossing east of London Bridge in later 19th century; construction of Tower Bridge 1886-1894 and its formal opening; the machinery; changes in river traffic; closure of high-level walkway in 1909; current possibility of new crossing still further east. 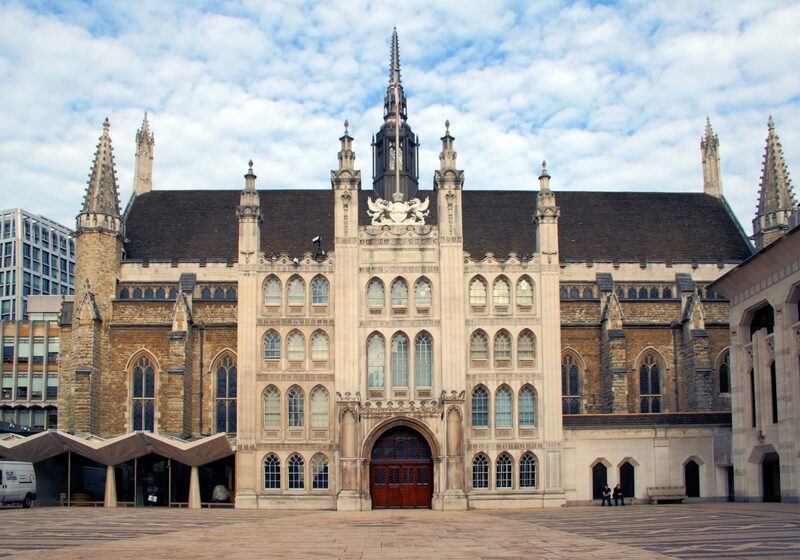 30 September 1980 City Waits; events leading to the foundation of what became the Guildhall School of Music and Drama in 1880; premises of the School; students and fees; Gresham Lectures; Corporation patronage for non-Corporation events. 31 March 1981 Contrasts between then and 1981; types of buildings; street cleansing; office practice and equipment; telephones, trains and tube; holidays and excursions; cost of living; City Imperial Volunteers 1900; major civic buildings; clubs; Lloyd’s; the author’s opinions on the camaraderie of business in the City in the past and the slipping standards of the present time. 30 June 1981 The marriage of Edward, Prince of Wales to Princess Alexandra of Denmark in 1863; Corporation’s celebrations of the event and its historical precedents since the 14th century; speed of arrangements; details of the City’s reception to the royal couple 7 March 1863; its gift to the bride; commemorative medal; extension of buildings in Guildhall Yard for the ball of 8 June 1863; specially-made china for the event auctioned off afterwards. 29 September 1981 Origin of the Corps in 1664; uniform; late 17th century Anglo-Dutch wars; drumming up recruits; City privileged regiments; nicknames; capture of Gibraltar 1704; Royal Marines’ badge; Langham’s Charity for Soldiers and Sailors; Royal Marine (City of London) Reserve; post-World War II links with the City. 30 March 1982 Government attempts to control alcohol sales for 400 years; licences since 1552; changing numbers of public houses in the City; the Morris Committee and reforms of 1944; Licensing Planning Committee, its duties and responsibilities; work of its City Sub-Committee since 1949; ratios of licensed premises to population; drinking habits; the current situation. Deputy Alexander George Coulson MA, LL.B. 29 June 1982 John Carpenter, his life, times and the City context in which he lived; his compilation of Liber Albus; his executorship of the will of Richard Whittington; rebuilding of Newgate Prison and Guildhall Library; Carpenter’s Children and the background to the establishment of the City of London School. 30 November 1982 The author’s view of the similarities between Roman London and British India; colonisation by armies of larger empires; revolts; overthrow. 29 March 1983 Mountjoy’s Inn since the 12th century and its ownership by New College, Oxford, since 1391; tenants and occupiers since then, lack of damage to property in 1666; 19th century redevelopment; new building in 1980. 31 May 1983 Thames crossings; proposals for a St Paul’s Bridge since 1852; Tower Bridge 1894; early 20th century ideas and objections; 1911 Act and architectural competition for the proposed St Paul’s Bridge; relationship with Southwark Bridge; First World War and stoppage of work; new Act 1921; post-War costs and consultations; St Paul’s Cathedral safety concerns; post-1929 financial crisis; death of scheme; rehousing of Southwark residents affected by the proposals and the Bridge House Estates working class housing south of the Thames. 29 November 1983 Natural history of the mute swan in England; royal ownership of the bird and grants of swans from the Crown; 16th and 17th century swan marks; price and prestige of swans; Dyers’ and Vintners’ Companies’ Royalty of a Game of Swans on the Thames; swan upping on the Thames every July by representatives of the Queen, the Dyers’ and the Vintners’ Companies; conservation and the numbers of swans. 29 May 1984 Fitz Stephen’s Description of London, 1175, including Smoothfield and its horsefair; area covered; cattle market from 15th century; Smithfield as a place of execution; Bartholomew Fair; numbers of animals sold and the nuisance caused; proposals for an Islington Market Bill 1834-1835 and the Corporation’s establishment of a Markets Committee; 19th century improvements and proposals; Metropolitan Cattle Market opened at Copenhagen Fields, Islington in 1855 and operated by Corporation of London until 1963. 31 July 1984 Meeting in St George’s Fields on 2 June 1780 and procession through City to present Lord George Gordon’s petition to Parliament; mobs on 3 June; next days of riots and destruction of Newgate and other prisons; end of riots by 10 June; reasons for riots beginning in Cripplegate; Roman Catholic chapels and Irish residents there; Corporation’s measures against the violence; successive Roman Catholic churches in the City since 1780. 30 October 1984 Biography of Henry Fitz-Ailwyn and his antecedents; site of his house through the centuries; his business and membership of the Drapers’ Company; his heirs and descendants; problems of dating the first mayoralty. 30 April 1985 Recent sale of 2 flagons from collection; St Mary Le Bow’s one of the finest collections of church plate possessed by a church anywhere in the world; origin of some of it in churches amalgamated with St Mary Le Bow; loss of church plate at Reformation; particular items and donors. 30 July 1985 City’s unique rights respecting military recruitment and marching through the City; City Imperial Volunteers’ Freedom of the City in 1900; privileged regiments; Buff’s origins and the English regiments in Holland in 16th and 17th centuries; the Holland Regiment established in 1665 and its status as a privileged regiment from 1670; origin of the name “Buffs”; subsequent re-formations of the regiment; detailed antecedents of the Buffs and other privileged regiments. 29 October 1985 Increase in pollution as medieval London grew; Commissions of Sewers from 15th century and their responsibilities; lack of co-ordinated measures; development of the water closet and its effect on sewerage systems; Metropolitan Commission from 1848 and cholera; establishment of Metropolitan Board of Works in 1856; the Great Stink 1858 and Sir Joseph Bazalgette’s great work in building London’s new sewerage system 1856-1874; alterations to Bazalgette’s system since then. 29 April 1986 City’s Thames Conservancy jurisdiction from 12th century; fish and fishing in the Thames from the Middle Ages; ordinances to regulate the fishery; nets and engines; Waterbailiff and his duties; Courts of Conservancy and appearances at them; Company of Free Fishermen; fishing boats; sale of fish in the City and its markets. 29 July 1986 Loosening of Parliamentary control over local government from 1972; creation of Metropolitan Boroughs in 1974 and their relative wealth; decay of city centres leading to higher spending; party political conflicts and Ken Livingstone’s control of the Greater London Council in 1981; abolition of the GLC in 1986; the London Residuary Body; former GLC responsibilities passed to the City, including planning, highways and traffic management, building control, licensing of public entertainments, waste disposal, Museum of London, Greater London Record Office; statutory and voluntary associations created after the abolition relating to education, fire, waste regulation, etc; Rates Equalisation Scheme. 30 September 1986 Origin of the City Lands from earliest times, especially since the 1444 charter of Henry VI; common soil; delegation of Common Council’s property management responsibilities to Surveyors in 16th century, then to the City Lands Committee in 1592; first City Lands grant book and business contained in it. 31 March 1987 Brief history its 12th century foundation, the story of Rahere, the medieval hospital, the Reformation and Second Foundation in the 16th century, the 18th century rebuilding, 20th century damage and rebuilding, NHS administration of the hospital and the retention of the annual View Day by the Lord Mayor. 29 June 1987 Very brief histories and personal recollections of the Central Criminal Court, Old Bailey, the Mayor’s and City of London Court and the Guildhall and Mansion House Justice Rooms. Norman L. Hall CBE, LL.B. 30 November 1987 Brief history of Bartholomew Close, from its inclusion within the precincts of St Bartholomew’s Hospital, its purchase by Sir Richard (later Baron) Rich in the 16th century and its development from 1581 by his family for aristocratic and wealthy households (detailed) with some details of subsequent development, and a short account of Bartholomew Fair. 29 February 1988 The concentration of the “rag trade” in the Ward of Cripplegate especially from the late 18th century to the Second World War, and its subsequent decline, with details of the companies and trades involved. 30 October 1988 Brief history of insurance in the ancient world, medieval Europe and the City of London, especially after 1666, up to the early 19th century. 31 January 1989 Biographical article on John (later Sir John) Simon (1816-1904), Medical Officer of Health to the Corporation of London 1848-1855, noting the importance of his work in the City for sanitary reform and his subsequent distinguished career. 30 May 1989 Brief history of both rivers from Roman times to the present. 31 October 1989 The City of London’s and the Vintners’ Company’s involvement in the wine trade and the gradual decline of trade from the mid-13th to the late 15th century.